The concept of marketing nostalgia (like the 1960s generation's nostalgia) to young people has got to be an oxymoron. You have to have been there to be nostalgic. This is why I am always a little embarrassed when young people think they know what the 1960s was like and try to emulate it. I don't know what it was like some days and I was there. God bless them, but my sincere comment is "as if." Time is not linear, it moves (it would seem) on an exponential curve, up and out of the reach of the next generation. Perhaps time did not always move this fast. Even fast-moving rivers have some eddies and bays where the water slows down and gets out of the current. A human life is short in the broader scheme of things, but looking back it is plain to me that young folks living today have little to no chance of grasping the spirit of events in which I grew up. That's just the way it is. Movies like "American Graffiti" are like cartoons or quick sketches compared to the reality of the 1950s. Reality is only in the present, and is lost in retrospectives, like a footprint in the sand that you never made. It is amazing how time warps things. Those young now lack the facility to see and interpret the phenomena of earlier times. The scaffolding is gone and those times become a closed book. 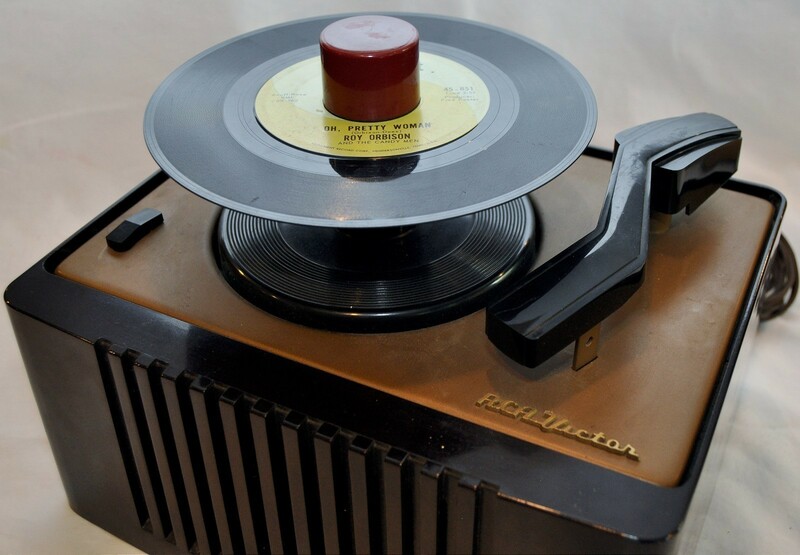 Do any of you younger folks remember the old 45-record players with the large center spindle? My kids may have never seen one. And that player is just the talisman, the touchstone. What about those 45 players when they were in the basement rec-room parties during the 1950s? We were teenagers, the lights were dim, and our eyes were on those basement stairs, watching for the feet of the parents entering our space. And we? We were dancing, dancing close, and making out while listening to songs like Earth Angel from the Crew-Cuts in 1955. "Earth Angel," just think about that concept. Angels on Earth; that was what girls were to we boys back then. The same goes for hit singles like "Love Letters in the Sand" by Pat Boone or "Come Go with Me" by the Del-Vikings, or "Chances Are" from Johnny Mathis. Each song was soaked in the youth of the moment it arose in. And there were hundreds of hit songs like that. Take the song "See You in September" by the Tempos, which peaked in 1959. Not a song that young people today would credit with much attention, but in 1959, having lost my girlfriend in that summer, driving down 7th Street in Ann Arbor, Michigan in my 1951 (deep green with a cream top) Ford Victoria hardtop coupe, with tears running down my cheeks as that song played, reminding me that I would not see her in September and had, indeed, lost her to a summer love. How do you pass that on? How does that remember? Or the simple fact that all of the early rock and roll songs were not something anyone had ever heard before; we were hearing them for the first time as they hit the charts, knocking us out. This was not some retro music that we thought was cool to listen to. It was "the" music, all that there was up to that point and, looking back, that music was incredible. We grew up in, on, and through it. Or how about the "Newport Beach Club" at Portage Lake, about twenty miles from Ann Arbor, a dance spot, with pinball machines. On hot summer nights we would drive there to dance to steps like the Madison, drink beer that we had someone buy for us, and try to meet girls. The sense of safety and space of those times and places no longer exists today. It can't even be imagined. The world has changed, grown up, and in some ways darkened. And we did foolish things. Newport Beach was where Bob Fulmer and I had our beer-chugging contest. I don't know who won, but I woke up while driving home and found myself off the road and headed for a tree. I averted that, but they tell me they found Fulmer lying in the gutter of a street in Ann Arbor the next morning, drunk. He was taken to the hospital. And there was the test car that my dad brought home from Ford Motor Company where he was an executive. It was in the late 1950s, and the car contained a special version of a new 360-cubic-inch engine. And it was fast! I was driving home from Newport Beach and I was going fast, faster than the cops could catch me. I was clocked at over 136 MPH. When I finally was stopped in Ann Arbor, I had three kinds of police chasing me, the sheriff from the lakes, the Dexter cops, and, of course, the Ann Arbor cops. I really got in trouble that time. My point is just that time (at least current time these days) is not linear, but exponential. We not only move on down the line, but that line curves sharply upward and out of reach to what came before the present. In other words, we don't just see down the line from the past to the present and on into the fog of the future. The fact is that we can't see around the exponential curve that time takes. We can't see the future, of course, but we also cannot see the past, at least not clearly, especially if we haven't been there. We can read about and study the past, for sure, but we cannot know it without having lived it. That is what "know" means. We really are caught up in the present moment. And so the movie "American Graffiti" is just a flat (perhaps pleasant) impression of an era that I lived in. Hot summer nights in Ann Arbor, out in our cars, and shamelessly driving in an endless loop from McDonalds out on West Stadium Boulevard (where the sign says they had sold almost 100,000 burgers) to Everett's Drive-in (also on Stadium), and then on to the A&W Drive-in (again on Stadium), and then the whole thing again. We did this as late into the night as we could stay out. When we weren’t driving around (a bunch of guys in a car), we were parked at the drive-ins, windows rolled down, with waitress-brought trays hanging off our cars. How many root-beer floats we had from the A&W or Coney Dogs (foot-longs), who knows? And we all smoked cigarettes. And later those summer nights, we would drive out in a convoy to Zeeb Road and race cars on a quarter-mile straight strip. Dozens of us would stand around while two cars ran the gears. And on cold-winter nights we would sometimes steal onto the Diag (central block) on the campus of the University of Michigan, pop a manhole cover, and (we were thin then) squeeze between the huge steam pipes and drop down into the steam tunnels that ran under the campus. Then we would run though the tunnels, always faster than any of the watchmen who would chase us. We would stop at their way stations and admire the pinups they had on the walls, or open the one-way doors into any of the university buildings. To us, that was real fun. We were what were called "Townies" and proud of it. And in all fairness, I am not alive to the spirit of the more recent generations (Generation X, Y, and Z) either, even though I lived through them. It would seem that real living is somewhere in the years you came of age, grew up, like when you finally bobbed up to the surface of the prime of life and floated on top… for a while. I am not nostalgic about Generation X, Y, and Z. My nostalgia is mostly limited to those years when I discovered myself and imprinted. I can't think too much who I was before that or care that much who I have been since. My internal recorder seems to have run out of tape when I breached the age of thirty.